Infographic: Pressures of Modern Day Masculinity in Singapore « Tech bytes for tea? “Empowered consumers have not only become a significant driver of our growth, but also the inspirational force driving our product innovations. In response to growing demands from consumers who are taking on a more active role in their health and well-being, Philips commissioned this survey to celebrate how consumer-sourced power informs and influences our product innovations,” said Mr. Jinseok Chang, General Manager, Personal Health, Philips Singapore. The survey was commissioned by Philips in conjunction with its launch of the Shaver S9000 Prestige in Singapore. The results showed that Singaporeans associate masculinity with physical appearance, such as being well-groomed, as an important factor for men to be viewed as presentable. Singaporean men are more likely to feel that society does not accept male vulnerability. What are Singaporeans’ views of masculinity stereotypes? Male respondents named these top three criteria: being supportive to others, being a good parent and having emotional intelligence. Female respondents named the following top three criteria: being a good parent, having emotional intelligence and being kind. More details below about the survey findings. Results revealed that more than half (52%) of Singaporeans polled used words relating to physical appearance to describe masculinity. 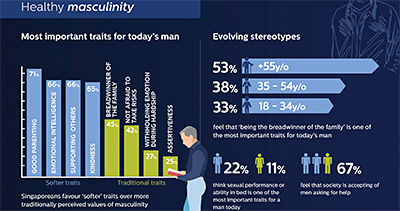 A man’s strength (49%), body physique (47%), being manly (42%) and facial looks (18%) were top ranking attributes. The majority of men (84%) and women (81%) viewed being clean-shaven as important if a man was to be seen as presentable. Almost two-thirds of respondents also related a man’s success professionally to looking good and being well groomed. Beyond physical appearances, the conversation around masculinity also revolves around behavioral traits, including how men think and act. The Philips Modern Masculinity Survey was conducted in collaboration with YouGov, a leading global market research and data company. 1025 Singaporeans (502 males; 523 females) were surveyed on pressures stemming from societal expectations in keeping up with appearances against evolving definitions of masculinity. Almost half (49%) of men surveyed admitted to feeling pressured to act or behave in a masculine manner to keep up with societal expectations of them. More men (54%) than women (43%) believe that society expects them to be authoritative and assertive. Men are also more likely to feel that society does not accept male vulnerability, although this viewpoint is more prevalent in older males. While traditional views of how a man must provide for the family still firmly holds its grounding, Singapore society is actually accepting of a woman earning more than her man. Singaporeans hold progressive views of masculinity stereotypes. Male respondents named these top three criteria: being supportive to others (67%), being a good parent (65%) and having emotional intelligence (61%). Female respondents named the following top three criteria: being a good parent (76%), having emotional intelligence (71%) and being kind (70%). These were valued over men being the breadwinner of the family (men 42%, women 48%), withholding emotion or feelings during personal hardship or pain (men 35%, women 19%) and being assertive (men 26%, women 24%). Progressively, Singaporean men are focusing on identity and self-awareness to take control of their lives. Investing time and effort in personal grooming were viewed as most important traits for today’s men. This entry was posted on Saturday, March 30th, 2019 at 9:00 am and is filed under Beauty, Figures, infographics, Launch, Lifestyle, Philips, Press Release, Study. You can follow any responses to this entry through the RSS 2.0 feed. You can leave a response, or trackback from your own site.